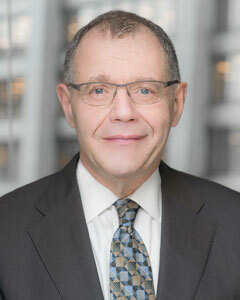 Joseph A. Camarra is Of Counsel at Brennan Burtker LLC. Mr. Camarra has dedicated much of his career to the defense of medical malpractice litigation for hospitals and physicians. He has extensive trial experience in complex medical cases involving neuroradiology, oncology, internal medicine, hematology, obstetrics and gynecology, endocrinology, and surgery. Mr. Camarra also has a wealth of experience in pre-trial litigation, including analyzing cases and analyzing medical issues in developing a defense strategy. He has handled cases involving a variety of medical specialties. Mr. Camarra has been a frequent lecturer on various medical and legal issues. He has spoken most recently on medical malpractice issues in Agra, India for the World Federation of Neurosurgeons. Mr. Camarra has been a guest lecturer at many hospitals in the Chicagoland area. In addition, he has been a guest lecturer for organizations such as the American Academy of Pediatrics and the Illinois Anesthesia Association. In 2004, Mr. Camarra was selected as a Leading American Attorney by his peers and in 2005 was named an Illinois Super Lawyer. Mr. Camarra has authored articles for the Illinois Bar Journal and Journal of Medical Practice Management. Brennan Burtker LLC is a premier health care and litigation law firm providing an unprecedented range of legal services to Chicago's health care industry. Our mission is to provide a full and broad range of legal services to Chicago's health care industry.